This post first appeared as a guest post here. 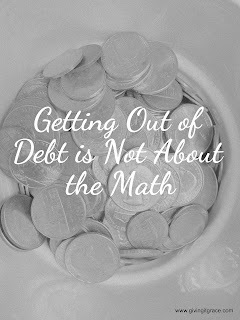 For the majority of debtors, lack of basic math is not the reason they have debt. In reality, it’s not about the math – if it was simply about math, we likely wouldn’t be in debt to begin with. On the surface, debt appears to be caused by lack of money. But money doesn’t spend itself; we have to tell our money where to go. Our circumstances don't cause us to go into debt , either; how we respond to our circumstances does. We're in charge of where our money goes, regardless of our circumstances. And what are we influenced by? Emotions. Getting out - and staying out - of debt is more about emotions than it is about math. Emotions are the pathway between our circumstances and our justification of how we respond to those circumstances.Justification is what makes the unaffordable seem affordable. It makes the unwise option seem like the only option. It makes the want feel like a need. It makes something the future not seem as relevant as the present. It makes an expected expense seem like an unexpected emergency. Justification only exists when the math is not in our favor, and emotions do a good job of blurring the math. If emotions get us in to debt, it should be no surprise that emotions can get us out of debt, too. 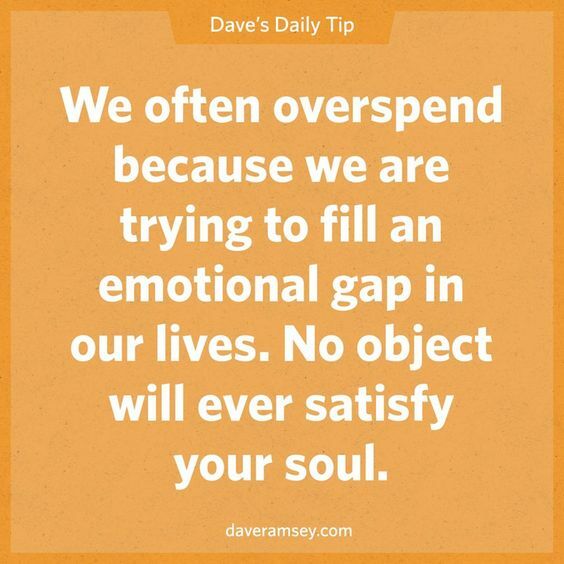 That is why Dave Ramsey's debt snowball works so well. He encourages the debtor to focus on quick wins: go after the smallest debt first, regardless of the interest rates on your debt roster. Make minimum payments on all other debts until the smallest debt is paid off. The rational is: once you pay off one debt completely, you will feel more energized to tackle the next one. That feeling will continue as you go after subsequent debts. Tackling debt is actually Step 2 of Dave’s steps to financial peace. Notice these are not steps to “getting rich quick”, but steps to having peace about your finances. (You can have financial peace and not be rich, by the way!). Peace comes from knowing where your money is coming from, where it is, and where it's going - ahead of time. 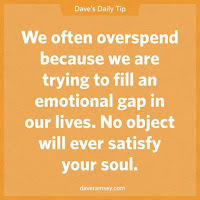 As Dave says: if you have trouble managing your money, having more of it wont help. Having a budget is a great way to keep emotions separate from the math. When circumstances strike, a good budget will help you make wise decisions that aren't influenced by your emotions.